What’s Happening in the Lot Market in Ford's Colony? 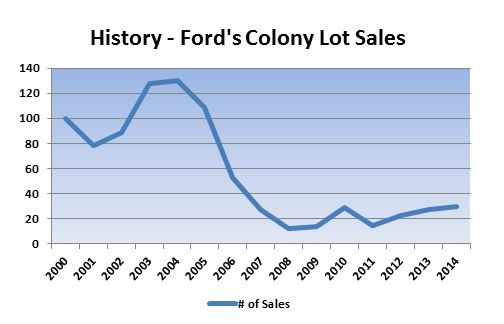 Over the past 15 years, we’ve seen some dramatic activity in the lot market here in Ford’s Colony. Sales skyrocketed in 2003 and 2004, and the data shown below actually underestimates the activity level since a significant number of lots were sold directly to buyers from the developer. Developer direct sales were not captured by the Williamsburg MLS which is the source of these statistics. You might call the peak a buyer frenzy. Buyers were confident, due diligence was lacking, and just about every lot that was listed for sale actually sold… and in a short amount of time. Most of these buyers are now enjoying Ford’s Colony life in their custom built homes. Some, however, have been trying to sell their lots and have fallen victim to a sharp market decline. Most of the successful sellers have taken significant losses as we have seen lot prices fall by nearly 50% from the peak. Currently, there are 140 lots listed for sale. Many of these have been on the market for years. What’s behind the sellers’ motivation? Most have had a change in circumstance which has derailed their plans to move to Williamsburg… health issues, loss of a spouse, desire to live closer to the grandchildren, etc. Some have taken advantage of bargain prices on the resale market. Some discovered that they could no longer afford to build the home they had planned to build. Others found that the home they had planned would not actually fit on the lot they purchased. Since construction in Ford’s Colony is scattered over the entire neighborhood, it’s hard to tell how many undeveloped lots are remaining. Most people will be surprised to hear that we still have about 500 lots that have not been developed. Buyers who are looking to build in Ford’s Colony can find plenty of options whether they are looking to downsize in St. Andrews Village, build a beautiful golf view home, or experience the ultimate privacy offered by the estate lots in Westport. Where is the lot market heading now? Well, we’ve historically seen a correlation between the lot market and builder activity. Builder activity was nearly non-existent between 2007 and 2012. We are now seeing an increase in both custom home construction and builder spec homes. The long time Ford’s Colony builders are very busy. Also, there’s a new level of excitement created by Wayne Harbin and the Southern Living Showcase Home and by several new builders who are now building new home construction in Ford’s Colony… specifically, Westmoreland, Stonehill, and Stephen Alexander. Don’t be surprised if we start to see noticeable improvement in the lot market over the next couple of years. 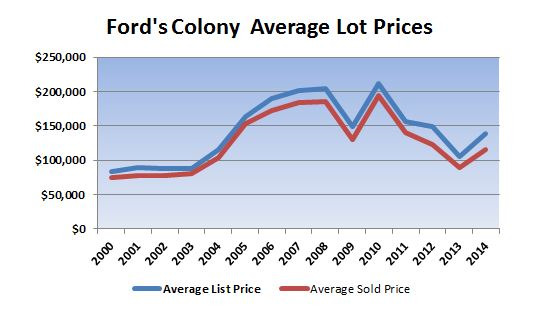 Have you been thinking about purchasing a lot in Ford's Colony, or do you have a lot that you'd like to sell? Contact Susan at 757-784-0363 or golfproperties@cox.net.